Welcome to Samoa, President Fritch! Prime Minister Tuilaepa Sa’ilele Malielegaoi has praised the determination and commitment of the Grey family to rebuild and revitalise Aggie Grey’s Hotel, which is launched this afternoon as Sheraton Samoa Aggie Grey’s. Tuilaepa offered his congratulations during his weekly media conference yesterday, prior to Samoa putting on a graceful welcome for the President of French Polynesia, Edouard Fritch, at the Faleolo International Airport last night. Mr. Fritch, set to be bestowed the Tagaloa chiefly title during a ceremony at Mulifanua this morning, is leading a high-level delegation from Tahiti that includes senior Cabinet Ministers, senior government officials and business associates for the opening. 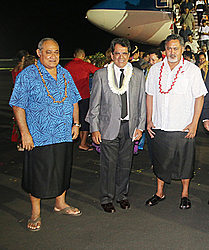 They arrived on an Air Tahiti Nui flight; one Tuilaepa hopes will be the first of many to come, further strengthening the links between the two Polynesian countries. Speaking ahead of today’s opening, Tuilaepa said the return of Aggie Grey’s could only be great for the local tourism industry, opening the door to further investment opportunities. “It’s a five star hotel which means that it will attract famous people to come to our shores and stay at the hotel,” he said. Locally, the Sheraton Samoa Aggie Grey’s Hotel will boost the employment prospects for Samoans. 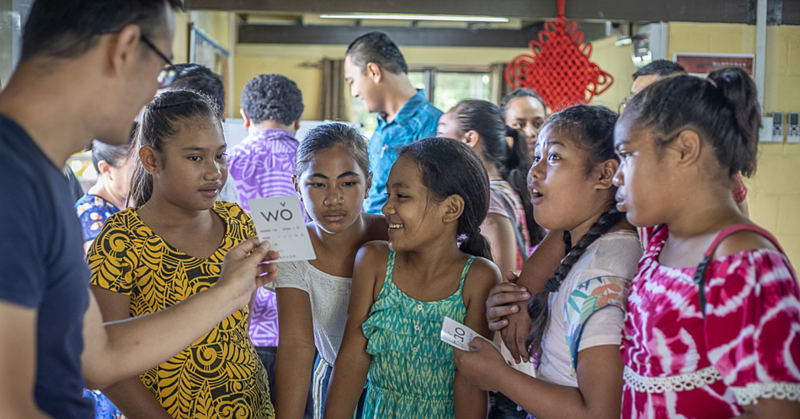 “It will help our people develop, especially in terms of employment for our children,” Tuilaepa said. Speaking about the renovation project that has taken three years since Cyclone Evan, Tuilaepa said the hotel owners have had to overcome a lot of challenges. “The renovation has been done for some time now,” he said. 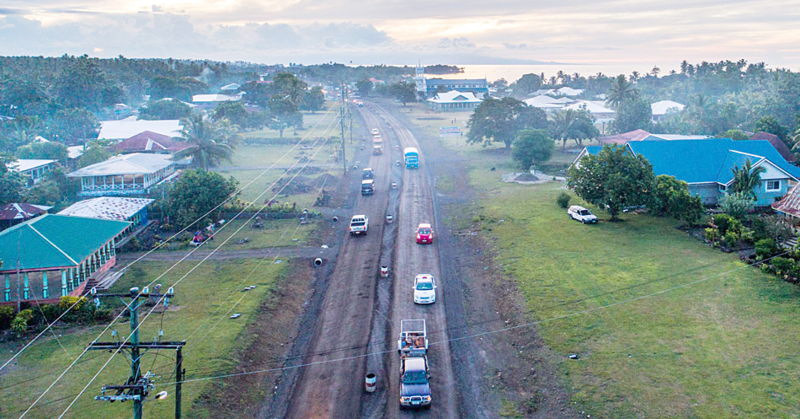 Looking ahead, Tuilaepa said there are plans in the pipeline to pull down the Vaisigano bridge and build a “hanging bridge” to alleviate the problem. The Prime Minister said this will solve the issue of the river being clogged up with logs, pushing the water over to nearby properties. As for the arrival of the President of French Polynesia, Edouard Fritch and his high-level delegation, Tuilaepa said it reflects the hard work of the Grey family to strengthen the links between the Polynesian countries. Tuilaepa said he was particularly excited about the prospect of Air Tahiti Nui and Polynesian Airlines working together to link Samoa to the U.S., Asia and European markets. He added that it is the reason why it is necessary for the government to expand the Faleolo International Airport. Works on the $140million project is already underway. This morning, Tuilaepa is scheduled to attend the matai bestowal ceremony for Mr. Fritch at Mulifanua before a bilateral meeting between the two leaders is held over lunch. The Prime Minister is then schedule to deliver the keynote address at the Hotel’s opening ceremony, which begins at 4.30pm on Beach Road. Traffic will be re-diverted in front of the hotel for the opening. President Fritch will join Prime Minister Tuilaepa and guests to check out the facilities and be treated to the services at Sheraton Samoa Aggie Grey’s Hotel and Bungalows. Among the French Polynesian delegation that arrived last night are the Minister of Tourism, Jean Christophe Bouissou, Minister of Economic Development, Teva Rohfritsch, Minister of Culture, Heremoana Maamaatuaiahutapu, Senator Lana Tetuanui, former President of French Polynesia, Gaston Tong Sang. Also in the delegation are the C.E.O of Bank Polynesie Tahiti, Christian Carmagnolle, Deputy C.E.O Bank of Tahiti, Emile Achkar, C.E.O Bank Socredo, James Estall, the owners of Pacific Energy, Albert Moux and his son Patrick who are also owners of Vodafone Tahiti, C.E.O of Satnui Stevedoring New Caledonia and French Polynesia, Eric Malmezac. The Chairman and C.E.O of Air Tahiti Nui, Michel Monvoison, C.E.O of French Polynesia Tourism, Paul Sloan, C.E.O of South Pacific Hotel Management Group, Laurent Bessou, the owner of the World Famous 6 Star Four Seasons Resort Bora Bora, Thierry Barbion, the President of the Chamber of Commerce, Vanaa Chin Loy, the owner of French Polynesia’s Largest Brewery, Jean Pierre Foucard are all coming. Set to open to the public next month since the devastation of Cyclone Evan in 2012, today’s launch is special for the relationship between Samoa and the tourism mecca of the South Pacific, Tahiti. President Fritch’s trip to Samoa follows the signing of a Memorandum of Understanding between Polynesian Airlines and Air Tahiti Nui (A.T.N) last year for flights to, from and beyond Samoa and Tahiti.